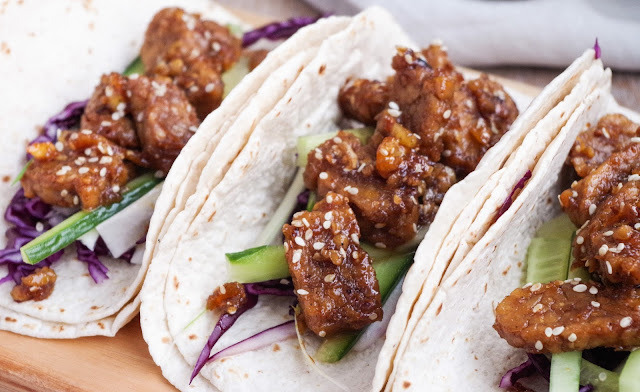 This next recipe is for orange glazed tempeh tacos...Asian fusion tacos filled with red cabbage, spring onions, cucumber and a glazed pan fried tempeh, made of marmalade, soy sauce, chinese 5 spice, ginger, garlic and sesame seeds. 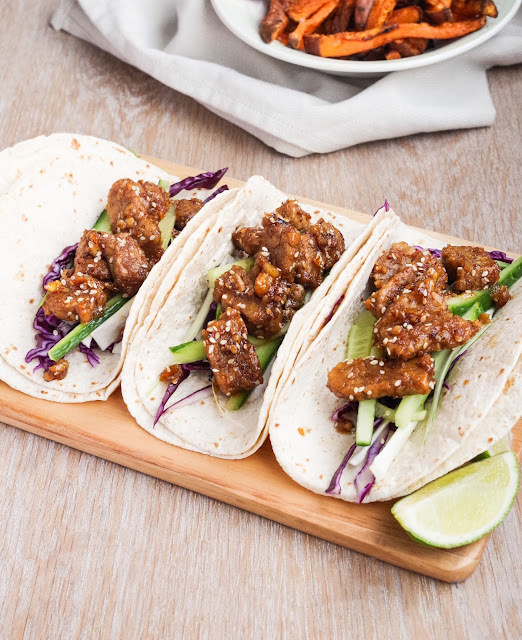 These tacos are sticky, sweet, fragrant and super delicious - a cross between a taco and an Asian duck pancake in flavour. Growing up we always had crispy shell tacos, it was all you could get at the supermarket, in recent years they have started to sell soft shell taco 'boats', but there is still a lack of the tiny taco tortillas in the shops - luckily you can now get tiny wraps for kids lunches and such, which are perfect for using as taco shells! As the wraps aren't quite as thick as taco shells, I grilled them and doubled them up for extra support to the fillings, but if you're trying to watch how much you eat, one layer should be sufficient. 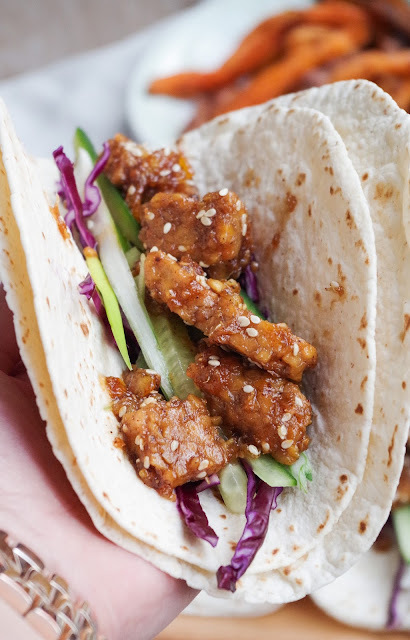 The crunch of the veg really compliments the sticky, soft tempeh in these tacos. If you're not familiar with tempeh, it's a bean patty made from whole, fermented soy beans - it has a very distinct flavour, quite similar to sourdough bread, which can seem a bit unusual at first, but you needn't worry, the glaze on these completely masks the tempeh flavour! Tempeh is a high protein food, containing good amounts of iron, manganese, phosphorus, vitamin B5 and potassium, not to mention it's a great source of probiotics (good bacteria) as it is fermented, which benefit our intestines as well as our immune system! These tacos are so easy to make too, from start to finish in about 20 minutes, I served mine up with some oven baked sweet potato chips for a little more veg, but they're also great on their own as a light meal/snack. Slice the tempeh and then chop each slice into thirds, pan fry with a splash of sesame oil until golden brown. Meanwhile, combine the marmalade, soy sauce, 5 spice, ginger and garlic in a bowl and put to one side. Prep the veg by thinly slicing the cabbage, spring onion and cucumber. Slice the limes into wedges. Once the tempeh is golden brown, pour the marinade into the pan and combine, reduce the heat and cook for 2 more minutes, but don't let it reduce too much, then stir through the sesame seeds and remove from the heat. Prep the tortillas by grilling for 10 seconds on each side and then form the tacos, with either one or two wraps as a base. Begin with the veg, then top with the tempeh, making sure you use all the excess sauce. Serve the tacos with a lime wedge, squeeze the lime juice over just before eating and enjoy!